Thursday March 1st heralds the meteorological start of spring 2018. It also heralds our return to Rum, the end of our winter adventure off the island. Or at least it should do, assuming all of our planned elements of the epic journey back there fall into place. Between now and then much lies ahead with much potential for veering off the path. There are two ferry trips, hours of driving and hundreds of miles of car travel in an aged vehicle packed with people, animals and ‘stuff’. So uncertainty and no guarantees but a plan at least. Once we get there further uncertainty lies ahead – how will the caravan and croft have fared in our absence? How will we feel once we are back? Will we have come home or will it feel like somewhere we have already left behind and used to live but don’t any more? It’s a whole load of questions and a whole load of emotions just now. Hopefully the answers will reveal themselves to us over the coming weeks and months. We have some idea of what we think we want to do next but there is a lot more talking, planning and working things out before we hatch a plan for that. For now though, the coming few days will be action packed, hopefully smooth and without too much adventure and as the chapter of our winter off draws to a close and spring arrives we’ve been reflecting on what the last three and a half months have taught us. * A feeling of purposelessness. In Glastonbury I knew what I was doing things for but for much of the rest of the time we’ve been off I have felt at a loose end and without a plan. * The distractions of the mainland and Ireland have meant that I have felt we have not been as much of a close family unit. * The expense of the last few months. We have spent a lot of money, some of which has been on things which we could have provided ourselves on Rum – eg heating when on Rum we can cut down our own firewood, or power when on Rum we have wind turbine and solar energy for free. * It’s been quite lonely in Ireland as we know no one. * I have fretted a lot about the car, not having a reliable vehicle plays on my mind. * All the mod cons. It’s been a nice break not dealing with emptying the toilet, getting gas bottles or jerry cans of fuel up the hill. Flicking switches and flushing levers without worrying about how things are getting to me or where they are going is quite the novelty! * I’ve enjoyed the retail therapy on the mainland and here in Ireland. * Christmas was exactly as I had hoped it would be with family. 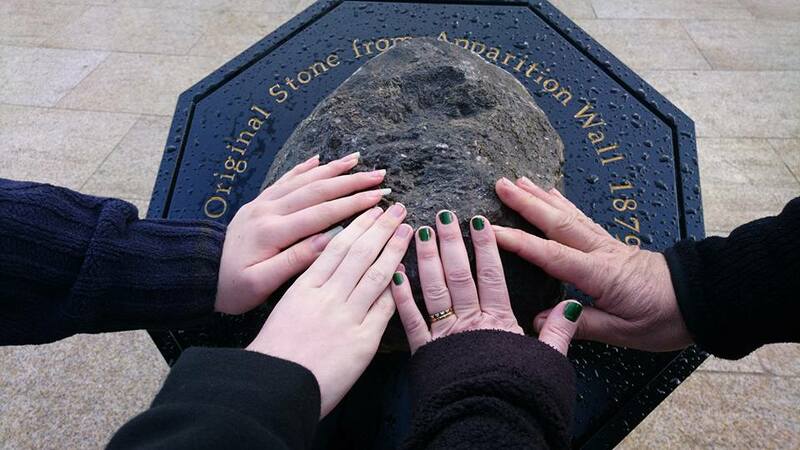 * I really enjoyed feeling part of things in Glastonbury. It reminded me of happy times being part of a work team and the good bits of my old mainland life being part of things like opening the farm shop and going to the staff Christmas party. 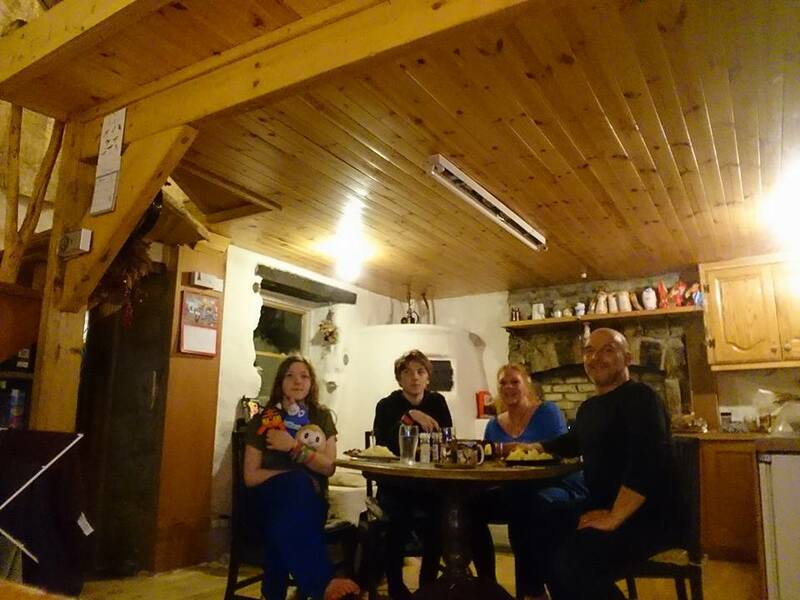 * In bad weather – and we have experienced some, particularly in Ireland – it’s been nice to be in a house unaffected by it. * I already knew but spending time at Glastonbury with a very ordered regime of animal husbandry bought home to me how inefficient we were towards the end on Rum. Rigid control of livestock numbers, planned breeds and strict feeding is essential to make sure you are not just running an animal sanctuary. 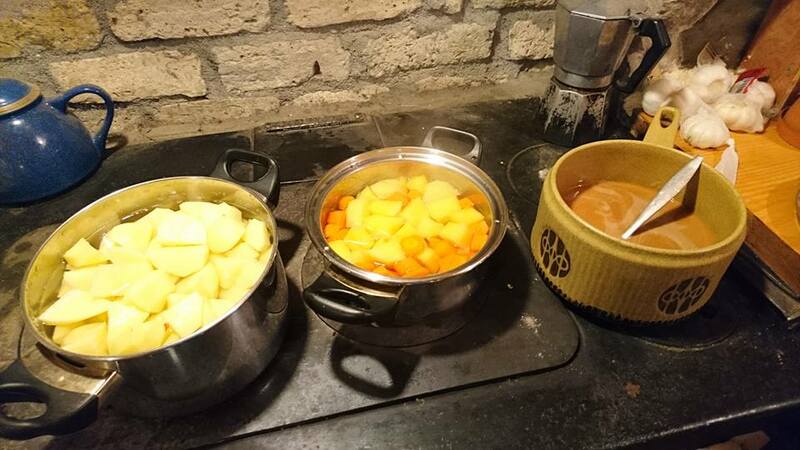 * Cooking on a range or in a clay oven is a whole new experience. * I had not appreciated just how much of a border and difference there is between Ireland and the UK. Having lived in Scotland for the last 6 years as an English person I was aware of divides but I’ve always really thought of Ireland as part of the UK and getting to grips with the different currency, road speeds and even things like not getting BBC radio has been a learning curve. 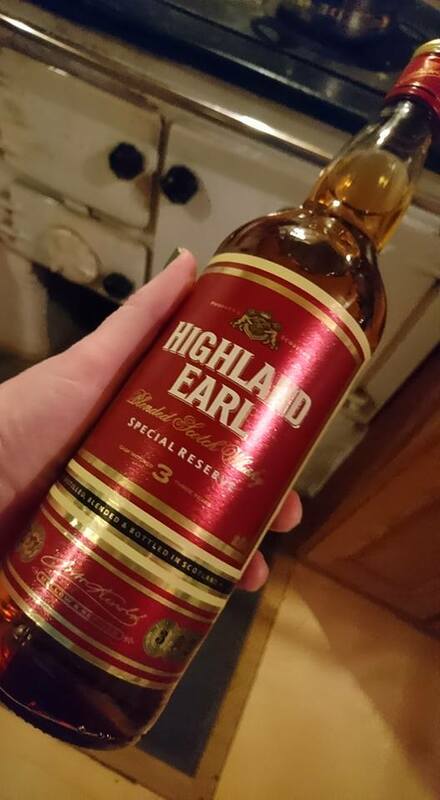 * I have learnt that Rum could actually be a long term prospect for us but that our current living conditions in the caravan, particularly over winters are not forever and that if we are going to make Rum work for us we need to find a way to work that out. * I have realised that for all the down sides of island life and the frustrations of island politics I really missed Rum and our life there. I understand how valuable being part of a community is and how much that means to me. * The water tastes horrible everywhere. I miss our Rum river water. * I really missed Rum. * Bonnie and Kira really didn’t enjoy most of the time off this winter. * We have had loads of car travel which I really don’t like. 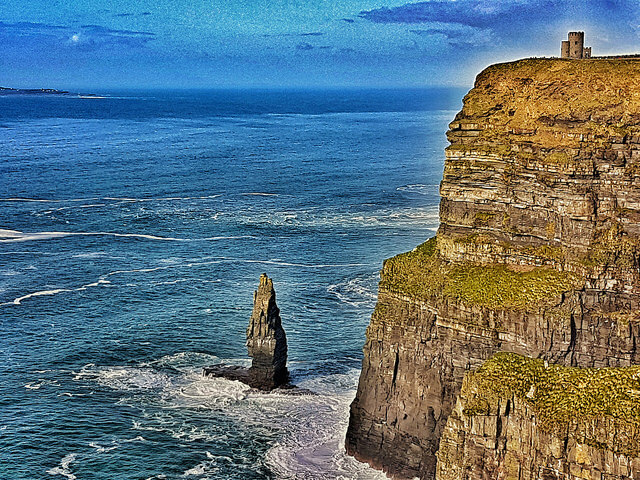 * The ferry travel to Ireland was a really long and miserable experience. * Spending time with friends and family. * I’ve enjoyed the access to fast food. * Bristol zoo for my birthday was a real highlight. * Horse riding at Glastonbury was really good. * I like sushi! I’ve never had it before and I really like it. * I learnt lots of facts about the Titanic. * How to play draughts. * I learnt quite a lot of family history and stories from spending time with my granddad over Christmas, hearing about his childhood and stories about his parents. * I’ve had quite a bit of independence while we’ve been off and learned about doing stuff on my own on the mainland. * I anticipated unlimited internet but we have not had that here in Ireland. 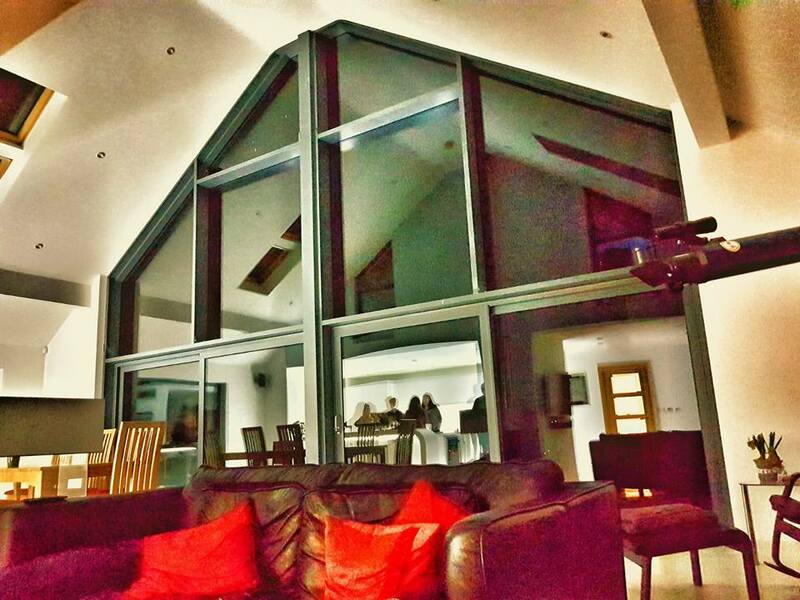 * The house here in Mayo is pretty remote – it’s not walking distance to anywhere so I can’t just go into town. * I don’t think I had as many opportunities to socialise as I would have liked. * I have had time spent doing things like walks or going round shops which are boring and pretty pointless. * I’ve had two colds while I’ve been off. The second one particularly was really nasty and I felt rubbish for ages. * It was good to spend time with family and friends. * I’ve had more time online than I get on Rum. * I’ve improved my drawing as I’ve spent quite a bit of time doing it. * I got an X box and a TV and enjoyed time spent playing games or watching stuff. * I’ve enjoyed the family draughts tournament. * Going back to Sussex and Glastonbury as an older person and seeing what has changed and what has stayed the same. * I’ve had a lot of chance to watch and downloads stuff and have really learned what I like in terms of genre, plots and types of shows. It’s felt like research for my own stories and ideas for making videos too. * I’ve learnt about different friendships and how some endure and some do not. * It’s been really interesting watching a much bigger society or community in action and seeing how people operate and social etiquette when people are strangers. * The travelling. The car journeys have been long, uncomfortable and a bit fraught at times worrying about whether the car will make it. I love the UK and enjoy exploring it but sitting on motorways in traffic jams in a cramped car for hours and hours has felt like a real endurance test. Our ferry trip here to Ireland was overnight with no chance of seeing any wildlife and with a long and tedious day spent in the car before as we waited for the ferry to run and a long and anxious drive afterwards with no sleep. * I have felt really guilty at times about Kira and Bonnie. On balance I know that they have been happier to be with us than to have been left behind on Rum but the travelling, the keeping them contained after their usual endless freedom and the times when they have had to put up with intrusions into their space. 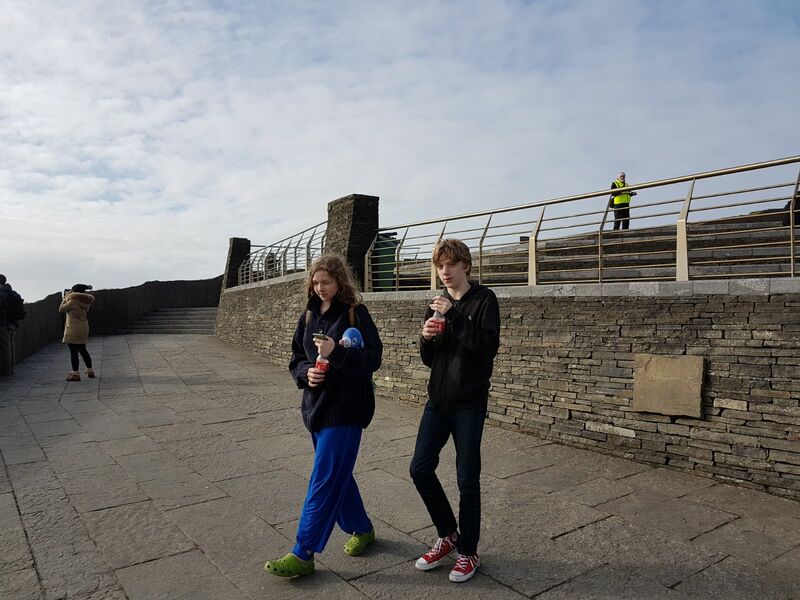 The four of us have made choices which have led us to our decisions and have been able to talk about, rationalise and balance out the highs and lows. The cat and dog have had no such luxury. * The famine or feast quality to our time off. We have either had full on socialising or weeks of seeing nobody. It would have been good to have been able to spread it out more. * The disconnect with the outside world and the unhealthier lifestyle we have led. We have all eaten more junk, sat around a whole lot more and not used our bodies as we usually do. There has been driving instead of walking, processed food instead of cooking from scratch, sitting and reading rather than carrying things up the hill or being out chopping firewood. 3 months is not that long and I am confident that a few months hard slog back on the croft will sort that out but I definitely feel pretty slothful after a winter off. * We spent a winter off Rum. All of the challenging bits of caravan / island life that make December, January and February really long, difficult weeks and months to get through have gone. Usually I feel as though we stagger out of the winter desperate for the spring but exhausted from the effort of surviving the harshest time of year. * It was so lovely to spend time with friends, many of whom we have not seen for several years. 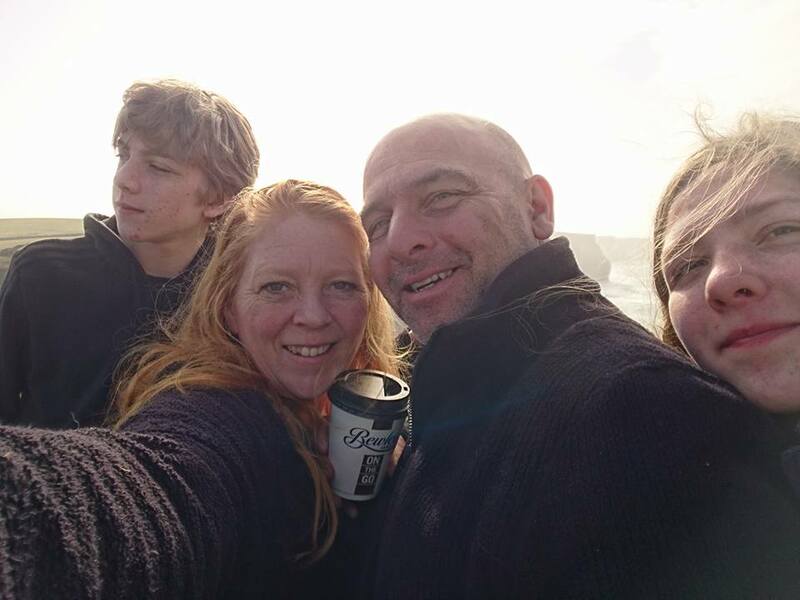 It was lovely to have friends and family to visit us without having to make the epic trip to Rum and to do things like meeting someone for lunch, going out for dinner or having tea and cake in a cafe. * I am definitely an adventurer at heart and it’s been really fun to be able to head off on jaunts and day trips, make snap decisions about what to do next and be a bit reckless. After five years of pretty much staying in one place it has been wonderful to add a whole list of new experiences, memories and photos of things we have done. 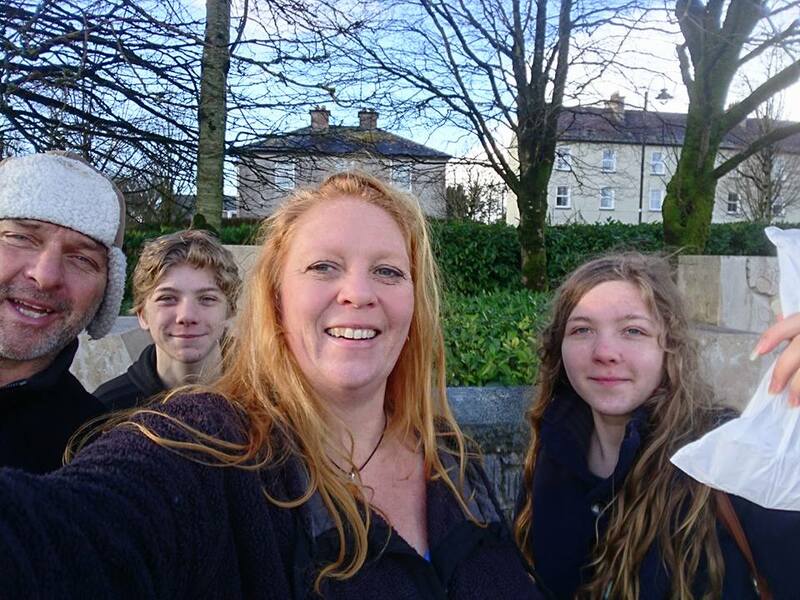 * It’s been really heartening to watch Davies and Scarlett enjoy the winter off, slot in at times while remaining true to themselves as individuals and be able to translate the independence and capability they both have as young adults on Rum with all that entails to being able young people in other settings. 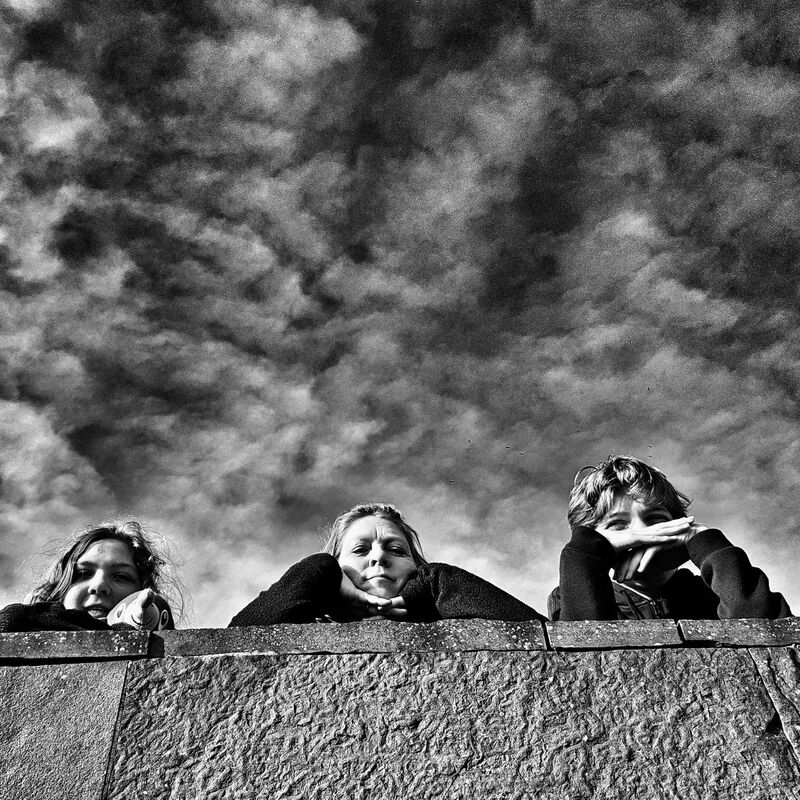 As a Home Educating parent, with children who moved from a fairly conventional life aged 7 and 9 to travel and then live on a remote island I have wondered quite what it would mean as and when they wanted or needed to step back into a more mainstream life. While they are still undeniably them with their own ways I can see that their unusual childhood has not done them some dreadful disservice. * I honestly felt that having lived a conventional life and then very deliberately having chosen to live an alternative one meant I knew the differences between the two options and how they compared. But there were things I hankered after or missed from our old lives and this winter was an opportunity to have them back. I am very specifically thinking about things like the washing machine or bath, access to shops and other resources, proximity to family and friends. I thought that I had done my fill of spending a half day totted up each week walking up and down to the village to collect things from the freezer, of spending a day a week processing laundry. Sure enough the novelty of daily baths, bunging a load of laundry on and pressing the button before I went to bed and waking up to a clean load, then popping across to the tumble drier and pressing another button for dry clothes if the weather was not suitable for outdoor drying were great. But at a price! I realised that the reality of laundry is that it *does* cost you a day a week regardless of your life. It can either cost you a day a week in processing it, walking up and down the croft, waiting around for it to be done, hanging it out and hoping for dry weather or it can cost you a day of working to earn enough money to buy a washing machine and pay to live in a property with power and water with the associated bills to cover those costs and a space for a washing machine indoors and maybe a tumble drier too. These are known as modern conveniences for a reason and often they are not actually saving us time, rather robbing us of it. I was reminded anew, or maybe re-educated about the choices I had made, why I had made them and spent a lot of time considering whether those were still my favoured choices or if I wanted to change the deal. *I learned what I missed about Rum – the view, the freedom, the people. It’s funny that these were the very things which led us to choose our life on Rum – somewhere beautiful, somewhere with a sense of community and somewhere we can have freedom to spend our time the way we choose. It’s been really healthy to have those desires tested and see if they are still of prime importance to me. And they are. *I’ve learned how much I have changed. Spending time with family and friends, sitting back in the scenes of my old life was like being taken back by one of Dickens’ ghosts of Nicola’s past. In just the last couple of weeks on Ireland we visited a place we had been to 14 years previously and I was so taken with the landscape I bored the other three taking photos and commenting on it. I couldn’t believe that we had driven that exact route years before and I had no recollection of how remarkable it was. It made me realise how much having children, Home Educating and the life choices we have made in the last decade have changed and shaped me and opened my eyes to the world around me. *I’ve learned some new skills, some new approaches to things and had some new ideas about various things from business ideas, craft projects, ideas for the croft. We’ve spent many hours talking this winter in various combinations of the four of us. Talking about next life steps for Davies and Scarlett, about next life steps for Ady and I. About ambitions and aspirations – both solo and collective. I guess these are not really learned until they have been fully formed and put into practise but it has felt like a period of real exploration and consideration. So, some duplication in things we’ve considered good or bad or learned, some bits some of us found highlights while others found challenging. We left Rum behind for the winter to avoid the worst time of year there, to have a really good catch up with beloved and much missed family and friends and to get some perspective away from our life to reflect on what we wanted to do next. We definitely achieved all of those objectives and we’re looking forward to seeing what impact the ripples moving out from the last few months will be. Stick with us, I suspect there will be more of the same to come. It’s been a gorgeously sunny day here today. We’ve had daffodils in bloom, buds peeping through the soil and birds starting to sing on and off for a couple of weeks but today was warm, sunny and most definitely spring-like. 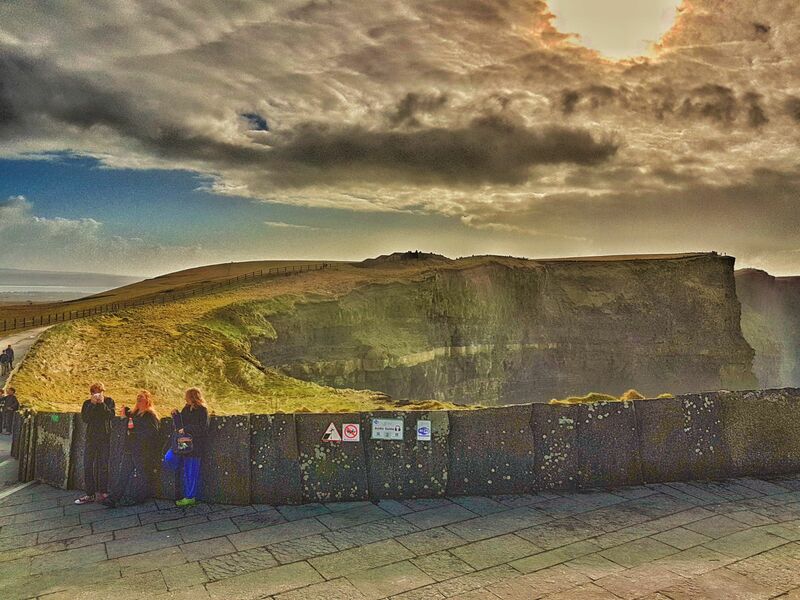 So we decided to visit the Cliffs of Moher. 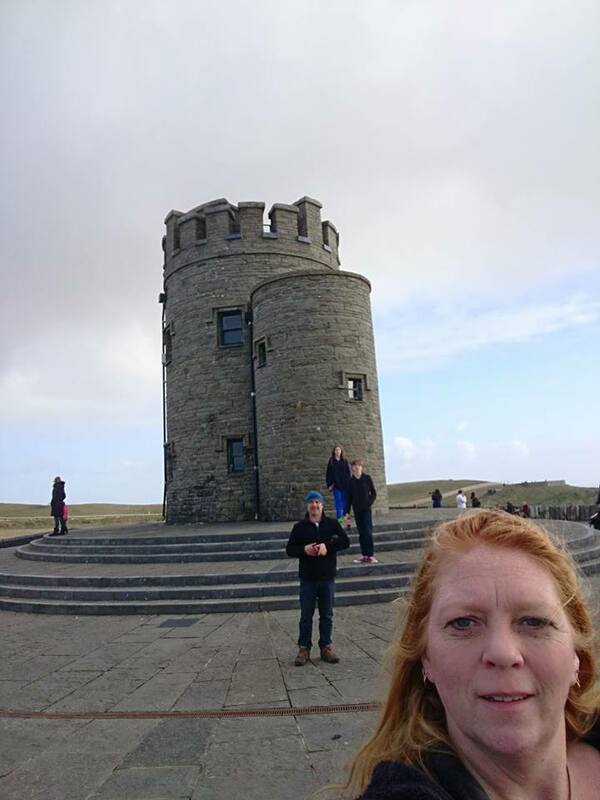 It had been recommended to us by several people and searching online for tourist-y things to do while in Ireland always brings it up. I’d also found details of The Burren and knew we’d be driving through that area too. Along the way we caught sight of a very tall structure that looked almost like a space rocket so pulled off the road to take a closer look. 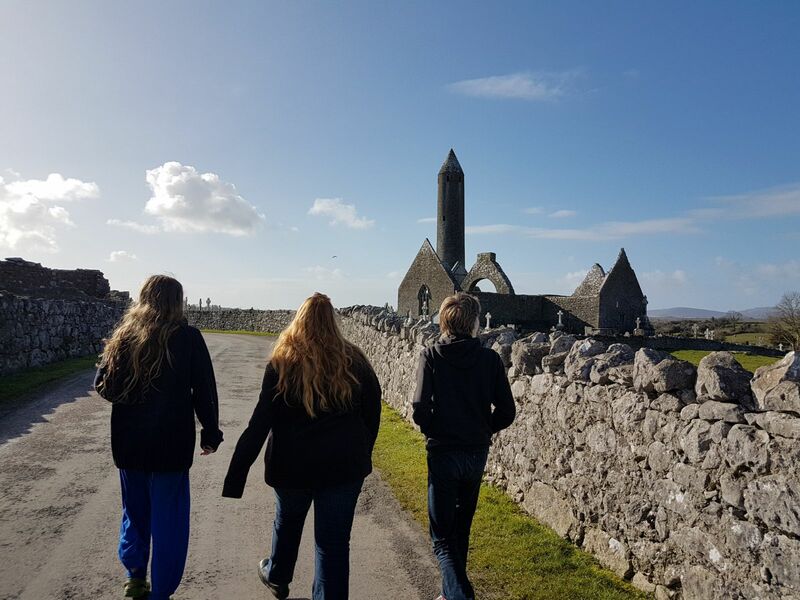 It turned out to be the round tower at the monastery of Kilmacduagh so we had a wander around there, looking at the buildings and reading the gravestones. We arrived at the Cliffs just after midday and had a lovely couple of hours wandering around there, mostly outside along the actual cliff edges (not as near as some of the visitors who were taking their life into their hands in pursuits of ever more daring photos. We were very sensible with our safety, if not our poses!) but also a look around the visitor centre including watching the video showing a gannet swooping around the cliff faces before diving into the water and swimming with dolphins, seals, whales, basking sharks and other sealife, then resurfacing and joining the other seabirds in flight and on nests including puffins and gulls. We saw mostly crows and gulls in real life. For a Tuesday in February it was very busy, I can only imagine how packed it must being during the tourist season in the summer. We downloaded the app to listen to the audio tour and had to correct our original proclamation to Scarlett that the next land was America when she claimed to be able to see it and we realised that actually Arran was rather nearer that New York! On the way in we had driven past signs for Aillwee Cave. 14 years ago, back in 2004 we came to Ireland for a 3 or 4 night stay. It was not a great trip; our car was broken into and all of our stuff was stolen and our ferry home was cancelled due to a ferry strike meaning we ended up on a much longer, later ferry with two toddlers, getting home around 3am with a bin bag taped over the broken car window. 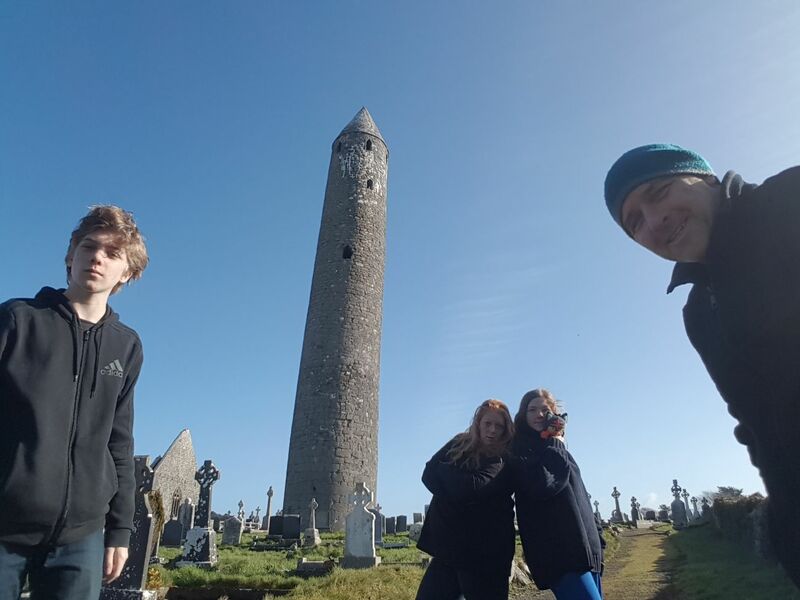 But we did have some good times while we were here including a visit to Blarney castle to kiss the stone, a day at Bunratty village, an open topped bus tour around Dublin and a visit to Aillwee Cave. 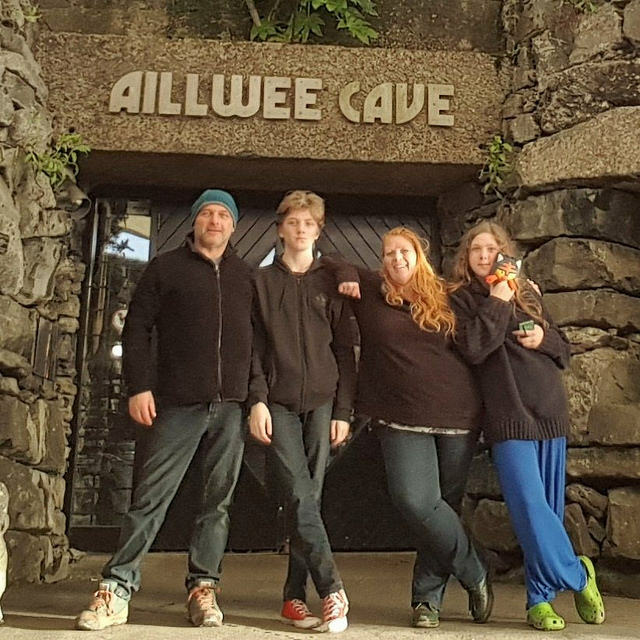 None of us had much memory of the cave itself (Davies as 3 and Scarlett was 1 so they are excused!) but we do recall buying Davies a little torch in the gift shop which he promptly lost. We looked everywhere for it and assumed he had dropped it. Back in England when tidying out the car after the new window was fitted we found the torch. It must have been in his pushchair and fallen out when we folded it up to put it in the boot. That torch was in the toy box in the playroom for years and years and may even still be in the small amount of stuff we have stored. So we had to visit the cave on the way back today, if only to see if they still sold the torches. But the cave tour was really good. All the usual stalactites and stalagmites, weird and wonderful rock formations, the tour guide turning off all the lights for complete darkness, the amazing acoustics of being metres and metres underground. I have no photos but the drive there and back was stunning. On the way we passed feral goats grazing on the Burren, loads of cattle with calves and sheep with lambs and the strange landscape of rocks, the big flat paving slab like formations which look like giant jigsaw puzzle pieces and the miles of grey which looks like a moon landing video clip or as though all the colour has been removed from your view leaving just black and white and shades of grey. On the way back the sun was setting after a glorious day of weather so we had pink skies streaked with orange above the grey. We got home just as it was getting dark but saw a huge murmuration of starlings in the distance and a smaller but closer group (murder) of crows flying in much the same way which I’ve never seen before. There are masses of crows here, I’ve never seen so many. All of the natural beauty and wonder of Ireland today for sure. Not mainland UK though – Northern Ireland. 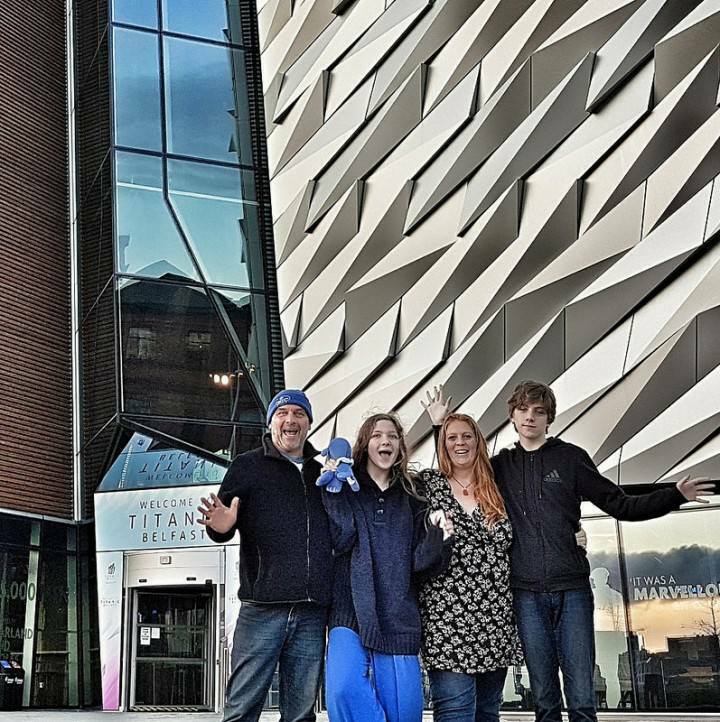 Last week we had a lovely four nights staying with our friends in Northern Ireland. Scarlett and I had visited before, last spring, but it was Ady and Davies’ first time there. It’s a nice easy drive from where we are staying in County Mayo. 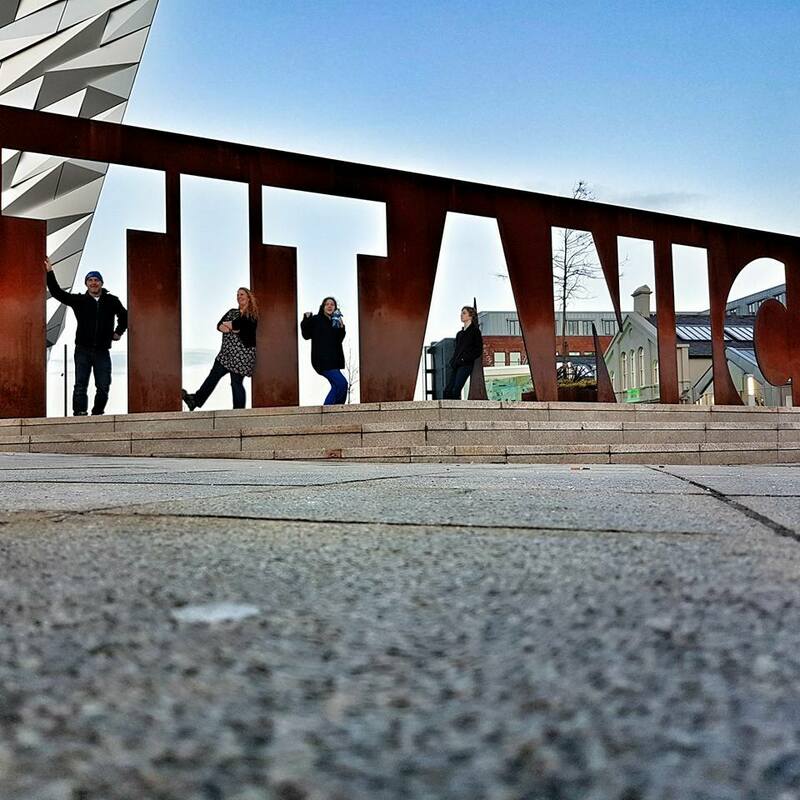 Our friends were at school / work on Friday afternoon when we headed north so we took the opportunity to head into Belfast first and visit Titanic Belfast Scarlett and I had spotted it and heard a little about it last year so it was on our list of things to do. The drive was slightly longer than we’d planned, mostly due to snow and ice on the roads at the start of the journey meaning a slower travel time but we had just over two hours and were there before the latest admission time. I would definitely recommend longer though – we saw everything but as (almost) proper grown ups Ady and I would have lingered longer over all the many interpretation and signs and read everything. You can see why it won 2016s world’s leading tourist attraction. Telling a story that everyone knows at least one version or retelling of in the very place it all started – right where the ship was built. 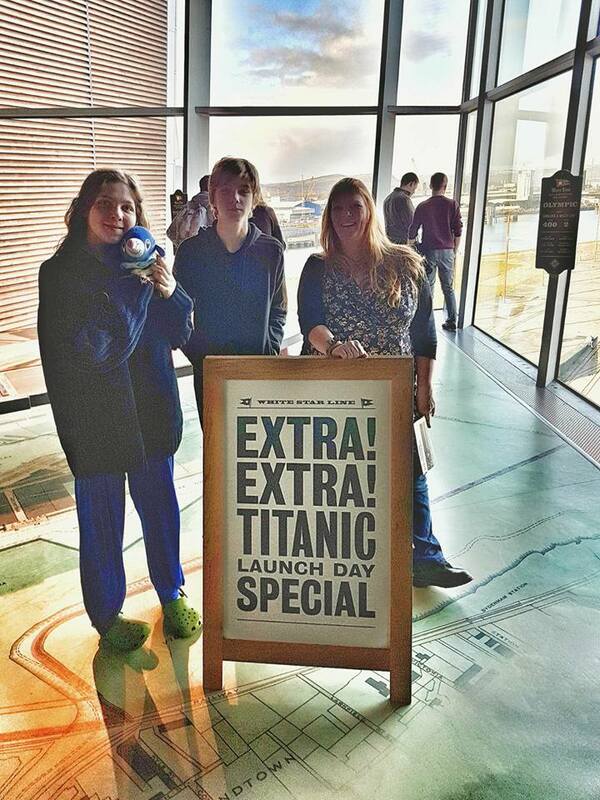 An excellent mix of interactive displays, recordings, artefacts and more. I’m at risk of sounding like a tripadvisor review so I’ll stop but if you are anywhere near Belfast and have three or four hours I would highly recommend adding this to your itinery. Along with the many, many other things to do in the city. 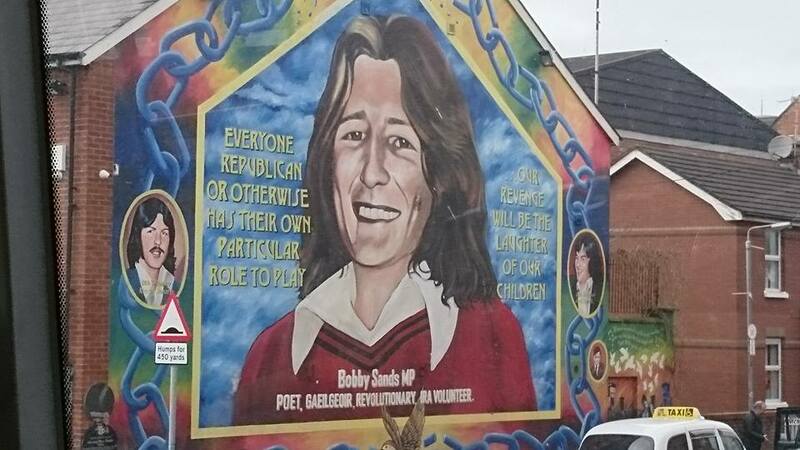 Ady and I did a city bus tour around Belfast – similar but slightly different route to the one Scarlett and I had done last year but taking in the peace wall, the murals, various other landmarks of key places during The Troubles and many of the new and renovated parts of the city too. Amazing to see how much progress there has been even in the 10 months since I was last there. Belfast is a really lovely city. I like it a lot. 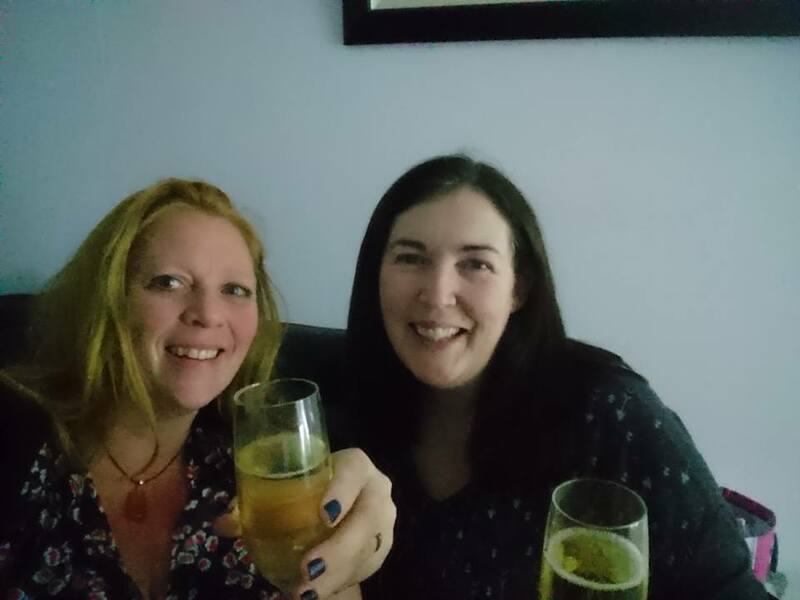 Another friend had flown across from Manchester to visit while we were in Northern Ireland which was a fantastic treat – we’ve not seen each other for about 8 years and it was so, so lovely to catch up in real life again. 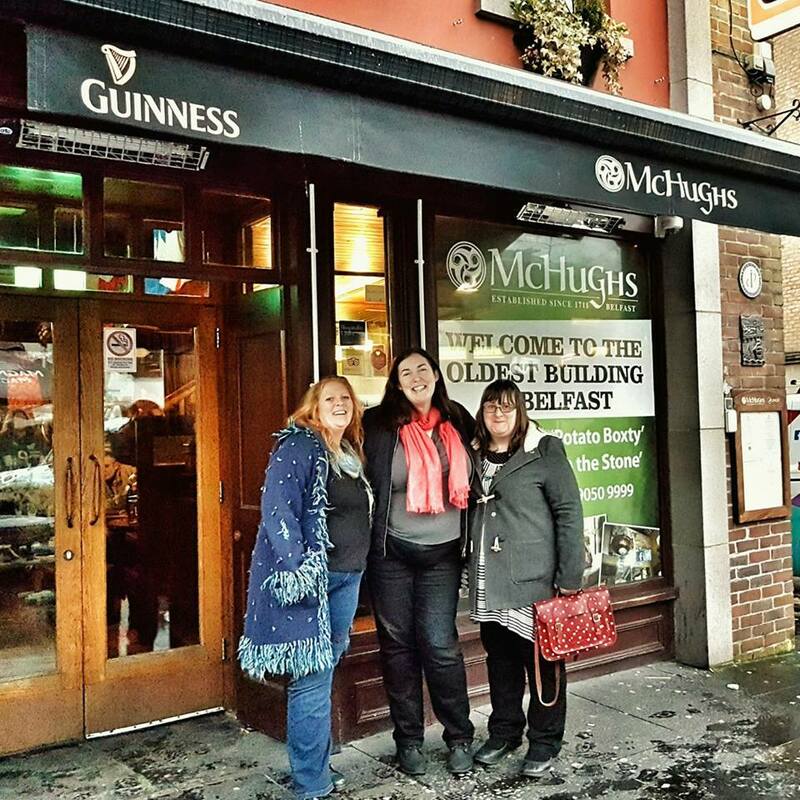 We met in another of the city’s landmarks – McHughs pub. Usually the location for traditional live music on a Saturday afternoon but that gave way to live coverage of Ireland winning a rugby match in the six nations. Not as exciting for me but judging by all the shouting and cheering at the various large screens throughout the pub no less exciting generally! 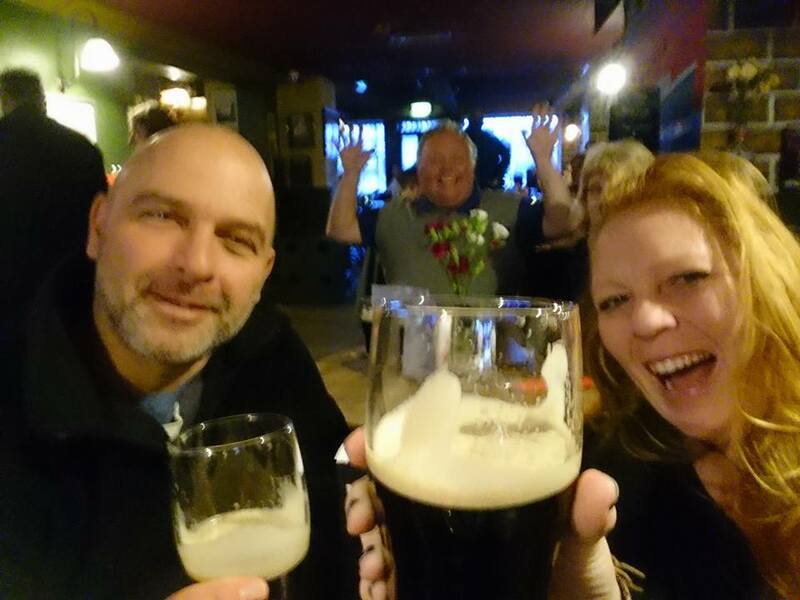 We got to have a pint or two of Guinness and sample some top craic with friendly Irish folk though. It was all good. 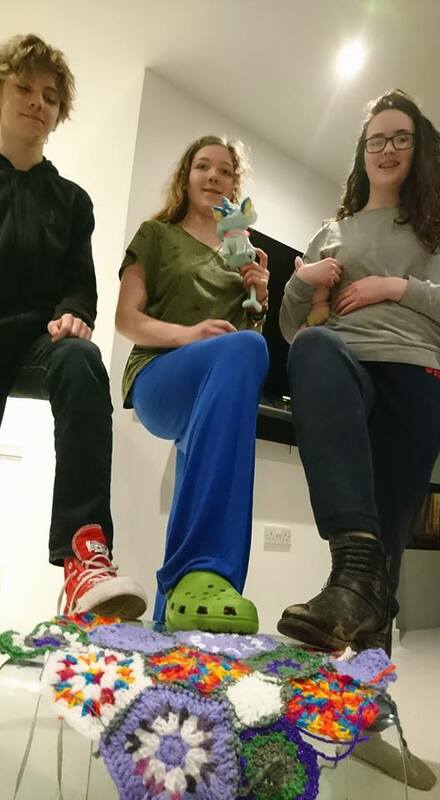 It doesn’t take much for teenagers to turn completely nocturnal and I confess to heading that way myself in certain company so much late night antics were on the cards – for the teens it seemed to be consuming lots of processed snacks and fizzy drinks, heading out for late night walks and watching a lot of youtube clips. 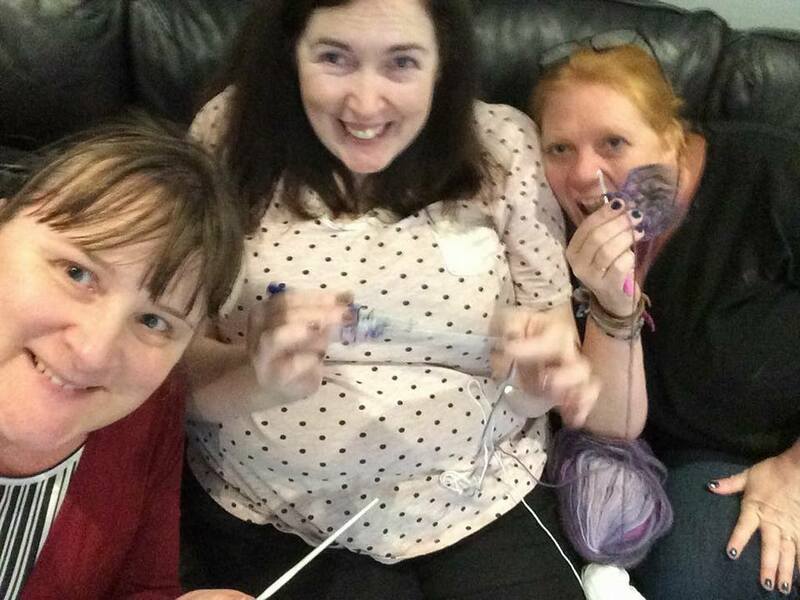 For the adults it was also fizzy drinks, along with some singing, ukulele playing and some peaceful craft skill sharing as we taught our friend how to crochet. We all watched quite a bit of the winter olympics too, but with the sound turned down, music turned up and our own commentary instead. 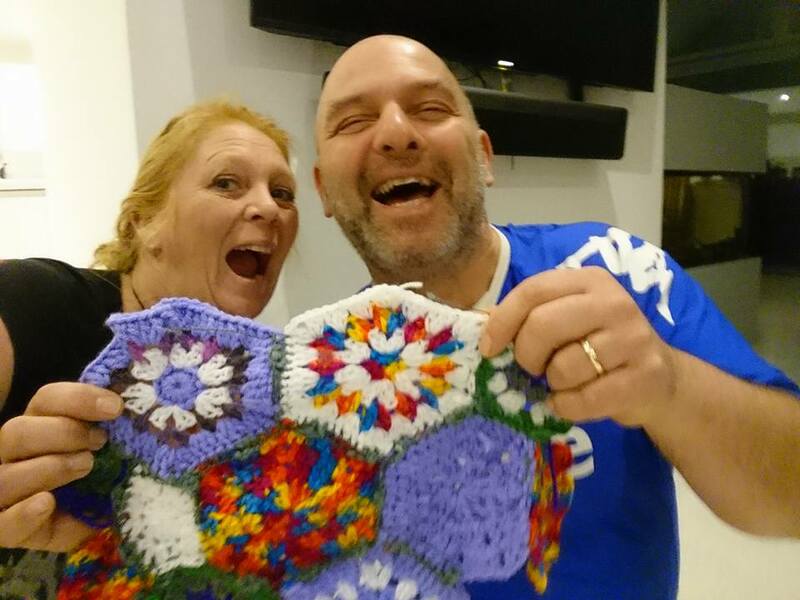 The crochet skills came in very handy on the Monday when our planned trip to the Giants Causeway had to be called off. 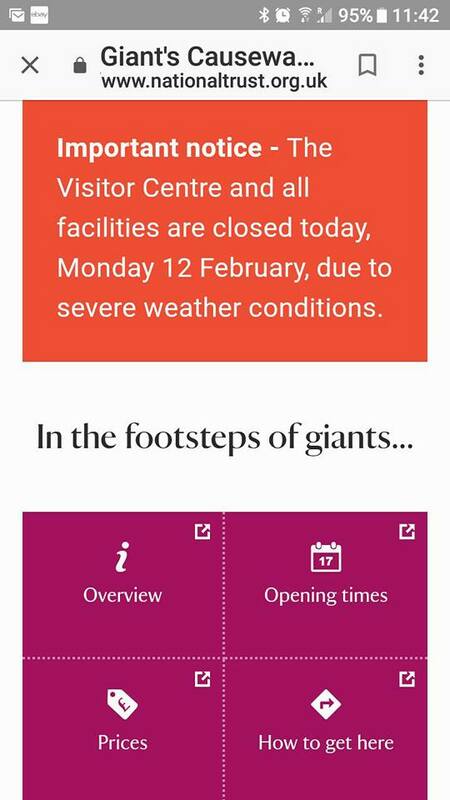 It had snowed quite heavily overnight and when we checked travel information we realised all of the visitor services at the Causeway had been closed due to the weather. Of course we could still have gone, but a four hour round trip in poor driving conditions to an outside destination which is slippery even on a dry sunny day seemed foolish. 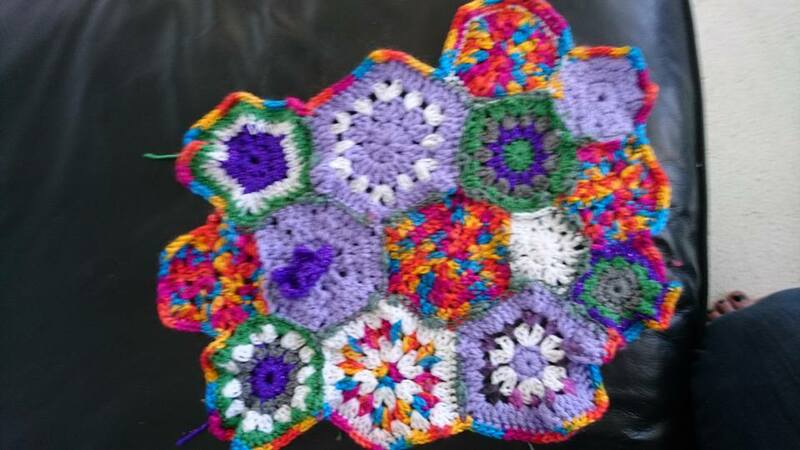 So I held a crochet hexagon masterclass and we made our own! It does not quite have the majesty or breathtaking quality of the real thing but what it lacks in ancient geology, huge size and natural wonderment it almost makes up for in colourfulness, portability and entertainment value! We’ve left it with our friends in case of any more of their visitors having a planned trip to the Causeway fall through. It does mean our plans for Northern Ireland are still not complete. Not this trip but a return visit is definitely on the cards. In December all four of us were laid low with a really nasty cold. 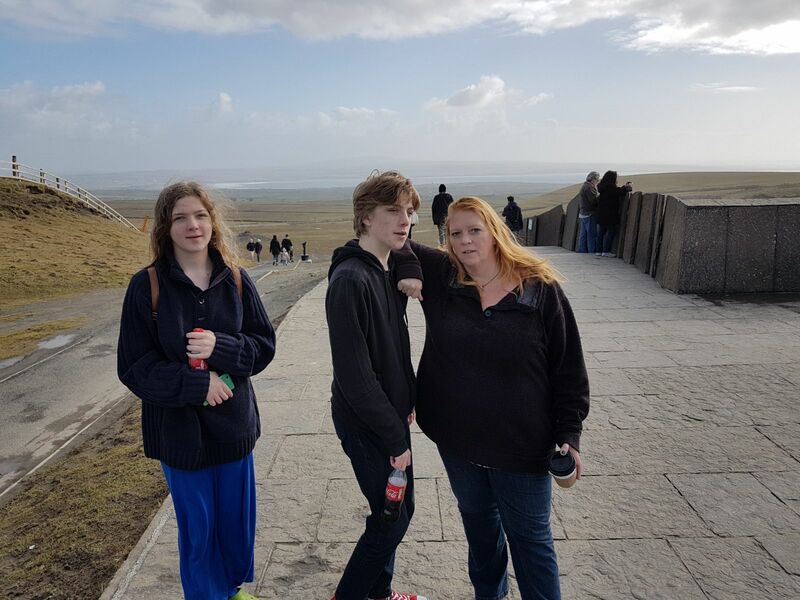 Fortunately it hit us just at the right time to not interfere with anything we had planned or events such as birthdays or Christmas but it had all four of us feeling rough. Ady, Davies and I have all had another cold over the last two weeks or so. Scarlett miraculously managed to escape it but it took the rest of us to our beds for at least a day each with associated moping, whinging and lack of appetite around and about. 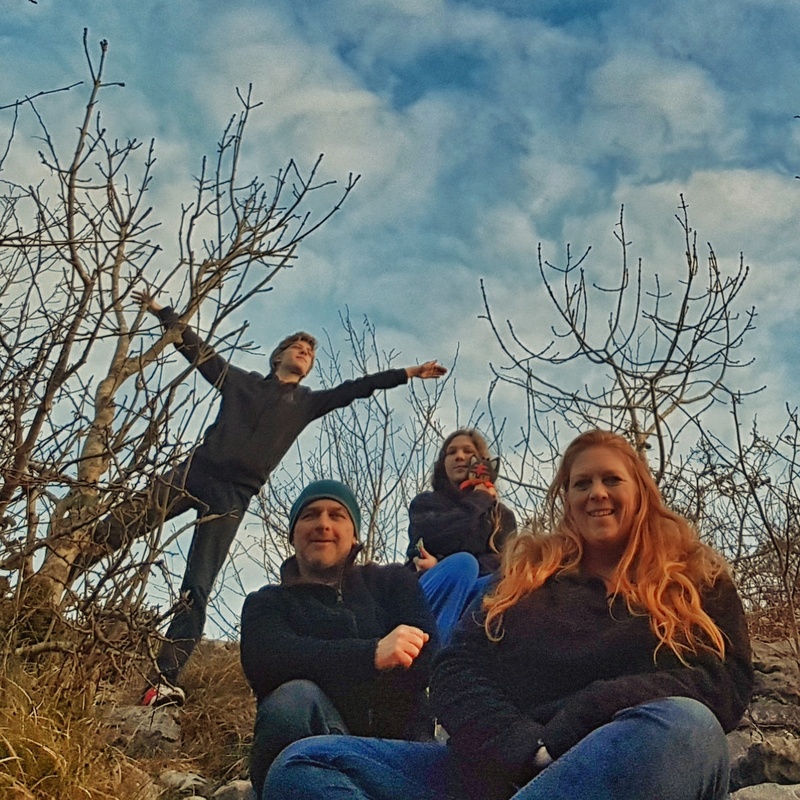 Living on a remote island with just 20 or so other residents with a mostly outdoors existence and a fairly healthy diet means we are pretty isolated from the usual germs and rarely get ill. It also means that we have not been exposed to anything for all these years and so when a germ is about we have next to no immunity against it. I guess if nothing else we’ll be returning to Rum with better immune systems! Aside from coughing and sneezing we’ve been working our way through a few dvd box sets picked up in charity shops. We also had a look at some of the titles our landlords lent us. I don’t think we share tastes in movies although we had watched a few black and white classics. Citizen Kane was a winner. Davies and I have been going great guns with our studying. We are far ahead of where we are scheduled to be on the study planner which is great as it means no immediate pressure when we get back to Rum. We are both really enjoying the study – both the routine of a couple of hours each day, the snuggling up to work through stuff and the actual content is really interesting. We have both submitted our next assessments which should be marked and returned to us next week and completed a few more of the online assessments which go towards our final marks. We are almost three quarters of the way through the content now and starting to think about further study options. I’ve been busy with my crochet hook too – if only to justify bringing off a very large bag of yarn with me from Rum which we have carried all around the place with us in our rather cramped car. I now have quite a collection of midges ready to sit on a shelf in the shed when we get back. Along with the pattern I usually use I also bought a pattern for a mosquito and made some adjustments to the pattern to make a midge and found some images online of smaller midges which I was able to work out a pattern for. I still prefer my freeform crochet as a past time but I didn’t bring any blank bags, notebooks or cases to stitch on to so midges it is for now. I can get creative again when we’re back on Rum and I have my usual view to inspire me. The cold virus and the cold temperatures – we’ve had a few snow flurries – have mostly kept us indoors rather than out exploring but we’ve plans for the next few weeks to get out and about a bit more and make the most of our Irish base. We realised today that it was already gone 530pm and still not dark outside. Living in a house is definitely adding an additional layer of disconnect between us and nature. Back on Rum while there were days that passed without me going outside, particularly at this time of year I was definitely more aware of what was happening out there. I am both missing and enjoying not missing that I think. Turning the calendar to a new page today means two entire calendar months have passed without us being on Rum – December and January. Both the worst months in terms of being there for the weather but also the best months for being there to celebrate Scarlett’s birthday, Solstice, Christmas, New Year, my birthday, Burns Night. We’ve built some fantastic memories of the 2017 and 2018 celebrations of those occasions in different locations instead, it feels strange not to have been there for them ‘at home’ though. Last week was Burns night, my favourite celebration on Rum. I love the food preparation – we’ve been involved in making the ‘staggis’ (Rum venison haggis) for the last few years, the ceremony of the order of the evening, I love the actual food, the poetry, the communal eating, drinking and telling stories, I love the ‘Rum twist’ of customs that are very much our own held within the community we live in. 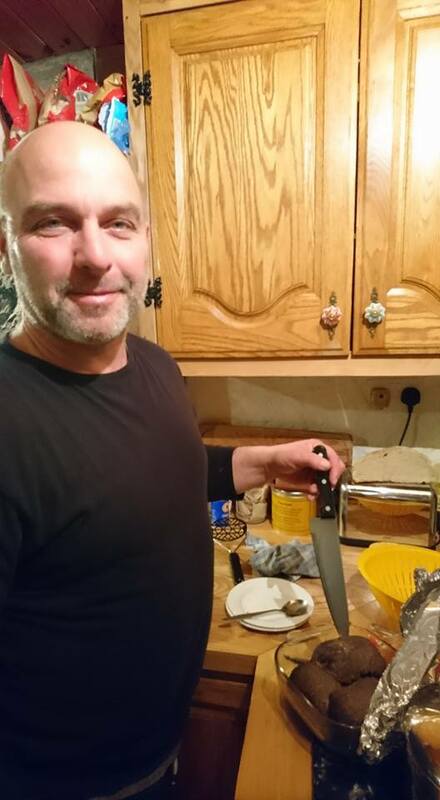 We cooked and ate haggis here, toasted lads and lassies and thought about our Scottish connections. 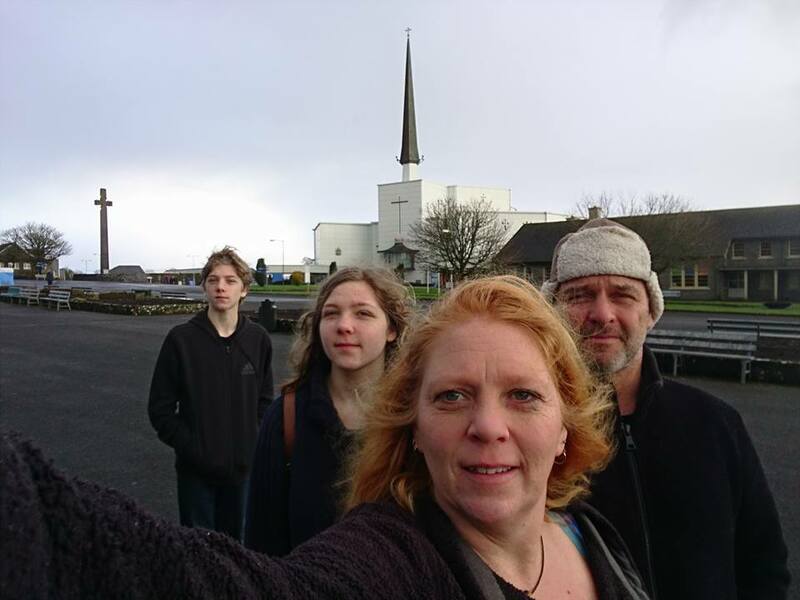 We had another ‘when in Ireland’ adventure and visited Knock shrine. Site of an apparition and place of pilgrimage for thousands every year. It was very quiet being January but the museum was excellent with a fantastic audio tour, we visited the one holy souvenir shop open in whole street full of holy souvenir shops to buy plastic bottles to fill with holy water. Davies and I got properly stuck back into studying, finishing and submitting our second assignments, Davies had a phone chat with his tutor and we started the third block of study. We are still slightly ahead thanks to our intense start back on Rum despite taking December and most of January off. 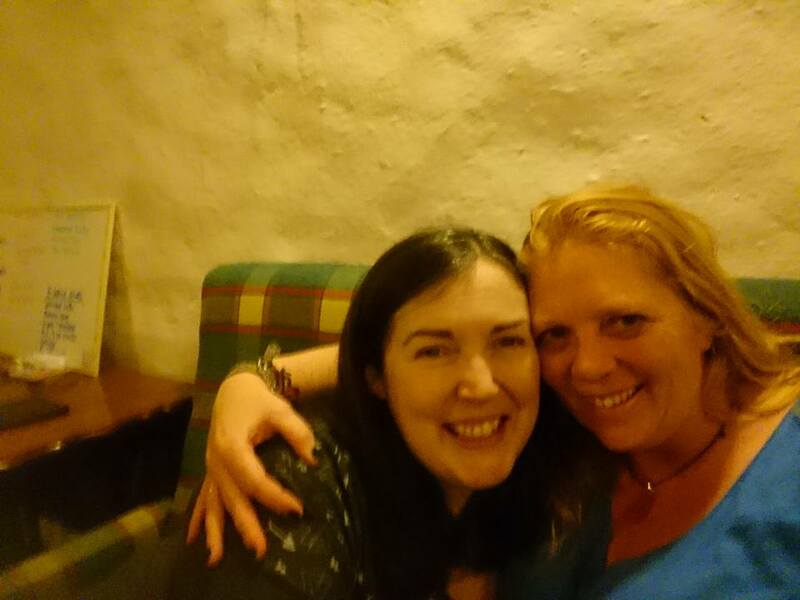 Easily the loveliest thing about the last week though was a visit from friends. It’s definitely been what the house and our time here so far has been waiting for – friends to make it feel like a home!